If you’re a race fan and have never been to Dover, it’s worth the trip. We had an absolute blast at this track. The racing was awesome, and it was a pretty cool place to take in a cup race. The first thing that I didn’t realise was how steep the banks were in the turns. At 24 degrees of banking in the turns, and 9 degrees on the straights, it’s almost like a mini Daytona. Watching the race on T.V. 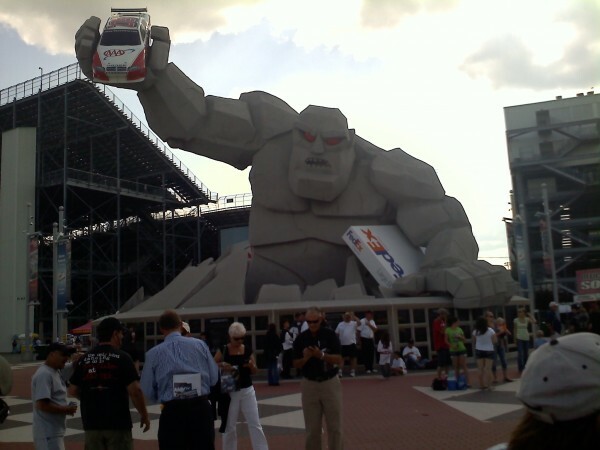 doesn’t give the track any justice, when you go there in person, then you know why it’s called the “Monster Mile.” This track chewed up stock cars and spit them out. The big one happened on lap 9 when Tony Stewart and the 83 tangled coming out of turn 2. The two cars spun blocking the entire speedway causing a 12-13 car pile-up. With nowhere to go, one car slammed right into another down the backstretch. They had to red flag the race for a while to clean up the carnage off of the track. The two Busch brothers, and Jeff Burton all suffered blown motors as a result of trying to tame the monster, but their cars would have no part of it as one by one their motors decided to expire. Jeff Gordon seemed to have the only car that could catch and pass the 48 Lowes machine of Johnson. However once again Gordon’s bad luck of 2012 continued when he left his pit stall and reported a loose wheel over the radio a few laps later, which forced him to pit under green. He came back out of the pits in around the 21st place, and luck never really seemed to be on his side to help him make his way back towards the front of the pack He finished 13th for his efforts. There was no stopping Kevin Harvick, as he also challenged Jimmie Johnson for the lead. He even had to pick his way back through the field after missing his pit stall on pit road, and then had to go all the way around the track to try it one more time so that his car could get serviced by his pit crew. Harvick took home a second place finish. On of the things that I had to laugh at (or didn’t expect) was that when we pulled into Lot 10 to park the RV, everyone was mowing their lawn. It was pretty comical, to see everyone with red lawn mowers strapped to their motorhomes. In NH the fans all have Radio Flyer wagons to haul stuff to the track.